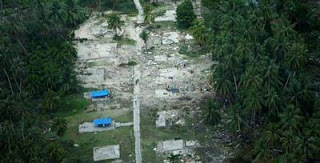 The team of researchers from the Indonesian Institute of Sciences (LIPI) in collaboration with research institutes in Singapore and the U.S. finds startling facts about the tsunami in the Mentawai. They just got back from the Mentawai associated with post-tsunami research mission that aims to detect tsunami wave length and wave height. "The earthquake which occurred slowly and long enough it can cause tsunami waves with a length of 8 meters and wave height of 14 meters," said Dr. Danny Hilman, geologists LIPI in a press conference held at the Building Advisory Council President, Jakarta, Friday (19/11 / 2010). Also attending the press conference researcher Hermann Fritz and Jose Borrero of the United States. Danny said that the tsunami waves generated by earthquakes in the Mentawai somewhat higher. Tsunami wave itself tends to lead to the south so many areas that were swept. Meanwhile, the tsunami wave height in the north itself is only 5 to 6 meters. Jose Borrero claimed to be surprised by the discovery that the tsunami height. He does not think that earthquakes are not so perceived people around it can cause a tsunami is very high. The quake was a slow earthquake (earthquake quake lambatatau swing), as happened several years ago and cause a tsunami in Pangandaran. In his research, he also explained that when the community was experiencing confusion with the earthquake that occurred. "People (Mentawai) was also confused because the earthquake was much less pronounced but why happened in a long time," said Borrero continued his statement. Confusion is what causes people doubt whether to save themselves or not. Finally, the confusion that lead to casualties that BESA so quake followed by tsunami. According to him, the tsunami that killed nearly 40 percent of the Mentawai. After the earthquake occurred a few moments, the Mentawai people actually began to stand and save themselves. "After hearing the roar of the tsunami that disclosed such as jet aircraft, new residents fled to the hills, but too late," said Danny. Borrero said, the people of Java and Sumatra was already aware of the earthquake and possible tsunami. But perhaps, slow earthquake is still a new phenomenon for the Mentawai people, although not new in Indonesia and the real world. In order for these events do not recur, people need to get a pen getahuan about when to save themselves. "If an earthquake occurs in the duration of 30 seconds must have his strength was reached 7 on the Richter scale (SR). If it's more than one minute would have reached 8 on the Richter scale (SR). At that time, people had to flee or be evacuated," he continued. According to him, the community must begin to recognize and alert. However, people should not fear the quake and tsunami, but people just have to understand it and beware. Beware!